A tornado has devastated a Lancashire village, shocking its inhabitants. But how common is the weather occurrence? When the inhabitants of Hoghton made their bank holiday plans, they probably failed to take freak weather into account. However, when it came, villagers could not ignore the fact that a tornado had paid them a visit. But perhaps the visit was not as unusual as it may have seemed at first. According to studies by the Tornado and Storm Research Organisation (Torro), the UK has the most tornadoes for the size of the country in the world. "There are around 35 reported tornados each year in the UK, but there could be more which aren't reported," said Laura Gilchrist, of the BBC Weather Centre. Britain has been struck by at least a dozen tornados in recent years and one person has been killed. However, the severe tornadoes such as those experienced across the central plains of the US are a rarity - although they are not unheard of. Monday night's storm in Hoghton, Lancashire, damaged around 30 homes, ripping off garage roofs and causing chimneys to collapse. Ms Gilchrist said: "The speed of a tornado can vary quite widely, but tends to be around 100mph. "They can destroy houses and cause major damage. "However, they are much, much smaller than hurricanes. A tornado can hit one house but leave the one next door untouched." The unpredictable nature of the occurrence means that it has had a varied impact on the UK. No-one died as a result of the Lancashire tornado, but in October Pamela Hudson became the first person to die in Britain as a result of a tornado since 1913. The 57-year-old holidaymaker died after being struck by a falling tree near Corfe Castle railway station in Dorset. The strongest tornado ever recorded in Britain, which hit Plymouth in 1810, was reported to have reached 213mph. And in May 1950, a tornado left a 100-mile trail of damage from Great Missenden, Buckinghamshire, to Blakeney in Norfolk. Tornados can also prove to be expensive. 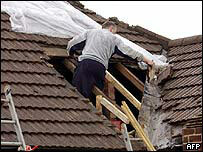 For example, a ferocious 100mph twister caused £10m of damage when it hit the Sussex seaside town of Selsey. The town, which was rocked by the powerful storm in January 1998, was hit again by another tornado two years later. 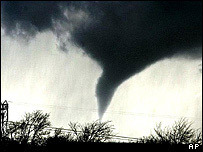 In October, 2002, more than 100 properties were damaged when a tornado ripped through part of Portchester in Hampshire. And more recently, in December, a handful of streets were struck by a mini tornado in Haverfordwest, south Wales, although neighbouring roads were unaffected. A tornado is the product of a thunderstorm, cold dry air above warm moist air and winds running counter to each other. As the updraft of air is struck by cross winds it starts to spin, and if this funnel reaches the ground it becomes a tornado. The weather system can lift dust and dead leaves - and occasionally small buildings. A typical tornado is around 100ft across and lasts for less than 10 minutes . But in parts of the United States, where conditions are more pronounced, they can last for over an hour, span up to one and a half miles wide and generate wind speeds of more than 200mph. On average 80 people die in the US each year as a result of tornados. One of the worst disasters was on 18 March 1925 when 689 people died in Indiana, Illinois and Missouri.